Here it is the uber-unrelEnting Halloween event you have been waiting for! The Largest Music & Performance Event in Thunder Bay. If you were at last year’s event, which seduced an incredible 2,150 in attendance, you know what hell-fire madness is! 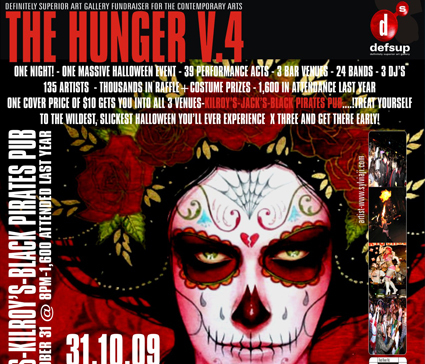 We now invite you to The Hunger Cabaret V.666 – a Halloween event of epic proportions, featuring 46 acts, so massive an event, it will take up SIX bar venues… see Black Pirates Pub + Jack’s + Kilroy’s + Crock’s + The Sovereign Room + HELL’s Story – for only one cover charge of $10. Pick your story, diabolic or devilicious. Move between bars and interact with every soul along the way, you could even win prizes in the street. Feed your hunger with a night of death defying performances and orgiastic maneuvers of delight… with 46 red hot incendiary acts! Featuring an unbelievable 36 live bands of all musical genres and Dj’s playing head to head for scario-tronic sound supremacy with 3 DJ Dance Party’s ending the night. See Saharan Belly Dancers of Sin, Satan’s Sister Fire Hooping, hot as hell Burlesque and Asylum GO GO Dancers, Necromancers “gore-lesque” Fire Manipulators, Drag Performances, Delusionist, Rocky Horror performance, Horror/Noir film, and Roller Derby Girlz givin’ you rough and tumble while dealing out their treats… big screen video projections and surprises! Advice… come early. There were 2,150 in attendance last year and you don’t want to miss a thing. Thousands in raffle prizes, and big prizes for best costumes at each location, free candy and suckers! Treat yourself to the wildest, slickest Halloween you’ll ever experience because at the midnight hour you’ll want more! And more you shall have with glee on SATURDAY OCT.29 at 8:00pm – The Hunger Cabaret V.666 -a sensual feast of poise and attitude! Nothing will be the same. The Inner Circle Of HELL – PERFORMATIVE+EXOTIC ACTS meant to thrill and delight! ASYLUM/GO GO DANCERS + DARK MESSENGERS [dancing all night] – You could win prizes in the street from them! Big Prizes for Best Halloween Costumes at all SIX locations… You are the performers here!